Anyone who is even vaguely familiar with the dietary industry is likely already aware that the company Met-Rx has been around for well over two decades. 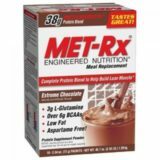 To its credit, Met-Rx has formulated some truly cutting-edge supplements and shakes. It is therefore interesting to see if its original protein supplement (also touted for losing weight) has stood up to the test of time and if its promises are real or simply smoke and mirrors. Let’s take a closer look to learn more. 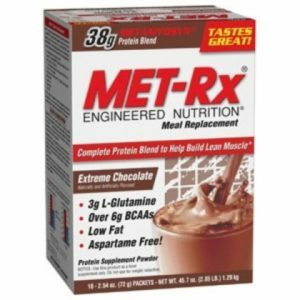 To be fair, Met-Rx has continually tried to improve the taste of its standard protein powder over the years by adding flavours such as fruit punch, creamy vanilla, apple and even pancake.However, many feel that they have fallen short of the mark. The main issue is that the company has never been truly able to eliminate a rather dry texture. This is one area which has improved substantially over the years. Drinking such a shake in the past would have been nearly impossible without the use of a blender and even then, the product would often settle out. Newer formulations enable this mixture to stay in suspension for a long period of time and even manually blending the ingredients should not present an issue. Our Score: 95% out of 100%. The texture is agreeable although arguably not as smooth as competitors such as Scitec or Optimum Nutrition. The powder will rarely clump although it should be mentioned that if it is exposed to moisture over time, the entire mix will become a “cake” and be rendered virtually useless. Our score: 70% out of 100%. The fact that this meal replacement contains more than three grams of glutamine as well as six grams of BCAAs (branched-chain amino acids) is impressive. No added sugar, zero grams of trans-fats and a gluten-free formulation are other factors worth noting. Still, up to 20 grams of carbohydrates may be too high for some consumers. We were rather unimpressed with a price of approximately £50 pounds for only 18 servings, as this equated to roughly £2.78 pounds per drink. However, this is considered to be average throughout the sports supplement industry and its cost has actually been lowered when compared to a decade ago. Our score: 60% out of 100%.